Japanese Episode 041: "Wake Up, Kabigon!" American Episode 039: "Wake Up Snorlax!" Satoshi and his friends are walking through a forest when an old man stops them and plays a song for them on his flute. After the little concert, the trio makes its way to a nearby village only to discover that there isn't any food to be found anywhere! A meeting with the village elder reveals that the cause for the famine is a nearby river drying up, so Satoshi and his friends decide to check it out to find out what the problem is. After making their way through some brambles, they discover that a sleeping Kabigon is blocking the water's path! Satoshi and his friends try a number of tactics to wake the behemoth, but their efforts are futile. The Rocket-Dan appear with the intentions of capturing the pokemon, but none of their plans are able to wake it up either. 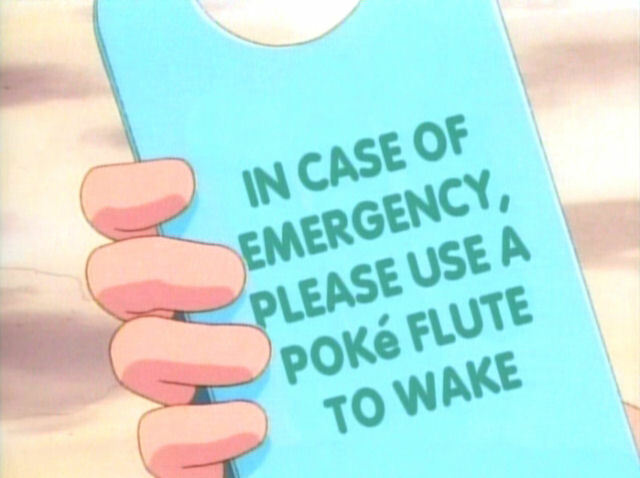 A solution is eventually discovered when a note found under the sleeping pokemon reveals that a Pokemon Flute can be used to wake it up. Satoshi looks up a picture of the flute and finds that it's the same kind that the old man they had met earlier was playing, so he and his friends return to the spot where they first met him. After the children explain what's been happening, the old man follows them to the Kabigon and uses his flute to wake it up. With the pokemon awake and out of the way, the water is free to flow and the village is able to produce food again. Sometimes, when I'm watching this series, I think about how great it would be if we could actually do some of the stories from the TV show in the actual video games. This episode is a perfect example of that. The kind of story we get here about a village in trouble is the kind of things that console RPGs have been doing for decades, and it could have been a great way to kill some time in the original games. After making your way through a thorny area, with the help of an HM or two, you'd get to run around and collect various items in an attempt to wake up the pokemon. Maybe Masaki, for example, could provide you with a bell to use on the Kabigon. 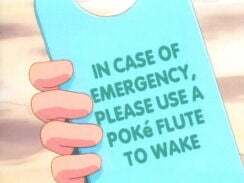 Or maybe you could get some water from the Hanada City gym and use that on the pokemon to wake it up. There are a lot of ways this could have been handled, and it's refreshing to see the TV series explore some of these options. It's a little weird to imagine the village not bothering to do anything about the Kabigon beforehand, though. Didn't anyone there think to investigate what happened to the river on their own? Why did it take a trio of kids wandering into your town before anything got done? Surely there's an axe or a machete lying around somewhere that could have gotten rid of those thorns! Wouldn't the villagers all be aware of the old man and the powers his flute has? This series has a lot of victims who are too useless to actually help themselves, so I guess I should be used to this sort of thing by now. Still, I can't help but be bothered at how conveniently the village having a problem and Satoshi's journey taking him through said village comes together. I guess I should also bring up the scene where Kasumi gets scratched and "bleeds" because I know I'll get a bunch of e-mails about it if I don't. I don't really want to, though, because there isn't really anything to talk about. Kasumi gets scratched - end of story. The way some fans talk about the scene, you'd think Kasumi's arm was gushing blood and that it was the most violent thing ever, but it's really not as dramatic as all that. If you want to see blood in this series, check out "The Battle Aboard the St. Anne." The stuff on display in this episode is nothing. The English version is beginning to catch up with the Japanese version. The show aired once a week in Japan but was airing at a rate of five times a week during early Kanto, so the show was bound to catch up sooner or later. Other than that, there are quite a few dialogue changes in here and a re-imagining of a key character, but all that will get discussed in detail below. Narrator: "Once again we find Ash, Misty, and Brock continuing their journey. And once again, the ever vigilant Pikachu keeps a careful watch for trouble...sort of." There's a small pun in the Japanese version about Pikachu being in the middle of a nap on top of Satoshi's backpack. 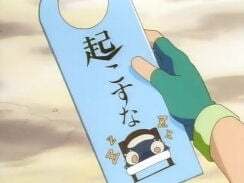 The Japanese line is Pikachuu mo ryukku no ue de ohirune chuu (リュックの上でお昼寝中). In Japanese, one of the ways you can say that you're in the middle of doing something is to add -chuu to the end of a verb, and, as you may have already guessed, the pun here is that Pikachu (Pikachuu in the Japanese version) has that same -chuu at the end of its name. The meaning's different, of course (the chuu in Pikachuu comes from the sound a mouse makes in Japanese), but the pronunciation is identical. This -chuu pun is one that the Japanese version uses a lot, by the way. It's kind of like their equivalent to the dub's "shocking" puns they throw at us every chance they get. Next up, we get the introduction of the "hippie." Hippie: "Groovy. Greetings, children of the universe." Misty: "Hello. Are you all by yourself?" Hippie: "I have my music." Kasumi's line is also a little different. She asks him what he's doing out there instead of creepily asking if he's by himself. I wanted to mention the fact that the music that the old man plays on his flute is the same in both versions. Little melodies like that, for whatever reason, tend to get changed in the dubbing process, so the fact that this old man's song is the same in English and Japanese is worth noting. As soon as the gang enters the village, a red sign and the board in front of a sign gets its scribbles erased. Later, when Kasumi finds out there isn't any more bread left, the sound effect gaan (ガーン) is behind her. 4Kids completely redid the background here because erasing the text on a background that's constantly moving like that would have been too difficult. I actually think 4Kids' background looks a little too nice here. 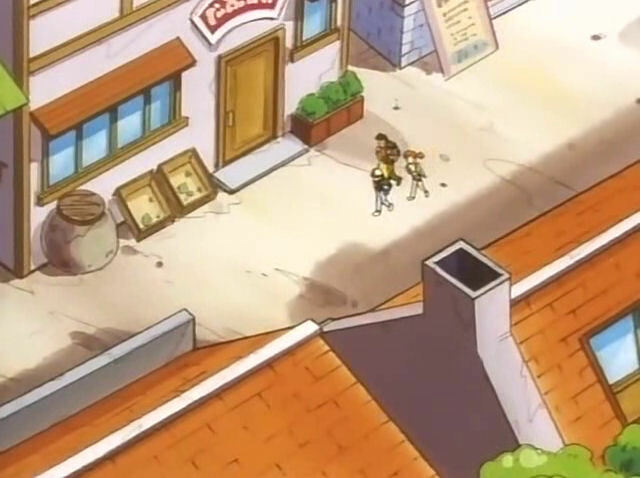 Doesn't it look more like a background you'd see in a modern-day episode than one from the Kanto era? Also, check out the blue outline around Misty, particularly around her left cheek and ear. There are a lot of these! Brock: "An entire town with absolutely no food anywhere." Mayor: "Children, what's the matter?" Brock: "We've been looking all over for food in this town but...there's nothing to eat. The setting of this episode is actually a village, according to the Japanese version. Not a town. Accordingly, the old man's title in the Japanese version is chourou-san (長老さん), which is closer to "village elder." The English dub calls him "Mr. Mayor," which is a title you'd usually give to someone who runs a town or a city. Misty: "We have to pay you back for that delicious meal. We'll find out what the problem is." Kasumi says they want to pay him back for all the bread and stew they were given. 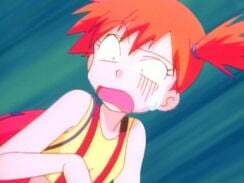 Misty uses the more generic term "meal" instead. This is also a good time to mention that Snorlax actually says its name when it's sleeping. Kabigon, on the other hand, just snores like anyone else would. It only pronounces the syllables in its name when it wakes up. 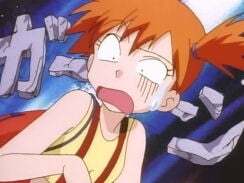 Misty: "Hey Snorlax, wake up!" Brock: "Wow, he's really big!" Takeshi doesn't comment on Kabigon's girth originally; instead, he just tells it to wake up, just like everyone else. He also doesn't use a masculine pronoun to refer to Kabigon, unlike his English counterpart. According to the Pokemon Zukan, Kabigon weights 460 kg (about 1,014 lbs). The dub rounds this down to an even 1,000 lbs. Misty: "We've got to move it, or the town will run out of water." Originally, Kasumi tells Satoshi that he'll have to wake it up and then weaken it in a battle before he'd be able to capture it. 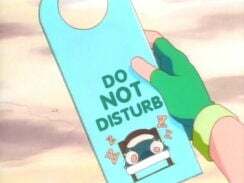 My guess is that Satoshi and his friends didn't want to attack a pokemon while it's sleeping, which is why Kasumi probably added that "wake it up" part at the beginning. Of course, it wouldn't have worked anyway since we eventually find out that the Kabigon belongs to the old man, but it was worth a try. James: "Good morning, everyone! Oh well. It's not really morning anymore. Who cares, anyway? I'm here to report on the eagerly awaited awakening of the Snorlax. Zoom in, cameraperson. Ah, it's sleeping. Still sleeping. Watch closely everyone. This is how Snorlax looks when it's sleeping. Ooh~, doesn't it look cute? Now watch carefully as we wake up the Snorlax." In the Japanese version, Kojirou whispers this entire monologue. The reason for this is because both he's taking part in a parody of a Candid Camera-type show called Ganso Dokkiri Kamera (元祖どっきりカメラ), which roughly translates to "The Founder of Surprise Camera." The show apparently had these segments called Ne'oki Dokkiri (寝起きドッキリ), or "Surprise Wake Up," where comedians would sneak into the rooms of an unsuspecting victim and violently wake them up in order to get a humorous reaction out of them. If you copy-paste the title of the segment (寝起き ドッキリ) into your favorite streaming video site, you should be able to find a few clips here and there. The dubbed version just has James speak in a normal voice since their hippie-loving audience wouldn't have any reason to know about this Japan-only variety show. It's also worth pointing out that Kojirou mentions that the current time is 2:00pm, something that James neglects to do. This will be the second reference to the show (the first was in the Erika episode), so I take it the show's producers are big fans? 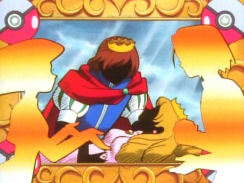 Jessie: "In the story of Sleeping Beauty, the beautiful princess, with whom I identify, was awakened by the kiss of a noble prince." James: "Jessie, that's it! Snorlax might just wake with a kiss from a noble Pokémon." 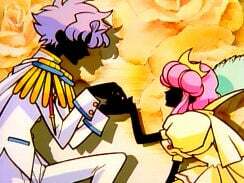 The original plan is to pick out a pokemon that's the most prince-like, not the one that's the most noble. 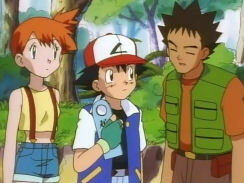 Brock: "What about Misty's Horsea?" Ash: "Yeah! That's right! It's like a prince's horse!" Misty: "What!? You want Horsea to kiss that!?" Ash: "It has to. Horsea's our best bet." This is pretty different from what was there in the Japanese script. Originally, Satoshi says that Tattsu should kiss Kabigon with its mouth, implying that the shape of it is perfect for kissing. Which is kind of gross, but whatever. Kasumi objects, adding that there isn't even a lake nearby to release it in. Satoshi says that they have no choice (which is pretty similar to what Ash says), prompting Kasumi to let out a big sigh. The only "text" visible in this shot are the Z's. What's odd about this is that in the very next scene, those same Z's are kept as-is. So why bother erasing them here? And now the Z's are back! 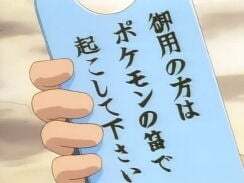 The Japanese there says Okosu na (起こすな), or "Do not wake up." 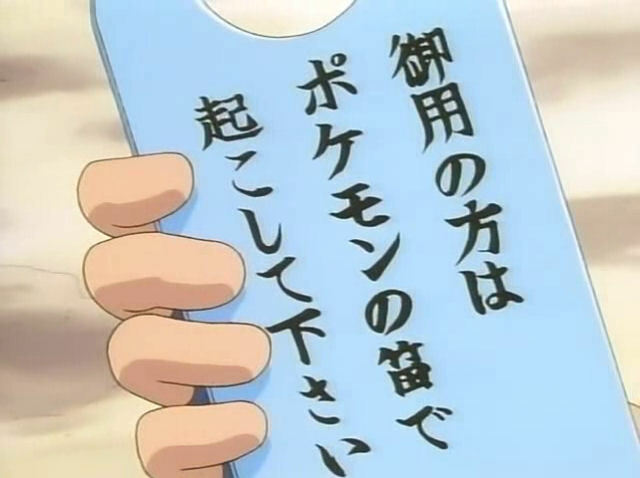 The Japanese text here reads Goyou no kata wa pokemon no fue de okoshite kudasai (御用の方はポケモンの笛で起こして下さい), or "If you need me, please wake me up with a Pokemon Flute." This last one is just 4Kids being thorough, since you can see a little bit of the kanji for okosu (起) there. The amount of food that Kabigon eats in one day is 400 kg (about 882 lbs). The dub rounds that number up to an even 900 lbs. Mayor: "This calls for a celebration! We'll hold a special banquet!" The village elder offers Satoshi and his friends all-you-can-eat bread and stew for their efforts. The mayor in the dub, on the other hand, offers them the much more generic "banquet." Musashi: "What should we do with this Kabigon?" Jessie: "Should we try to capture the Snorlax?" Nyasu: "Let's give up on it already nya." Meowth: "I ain't kissin' it." Kojirou: "It'll cost too much to keep it fed, anyway." James: "We'd better kiss it goodbye!" I would imagine that it's not all that surprising to hear that idiomatic phrases like "kiss it goodbye" don't really exist in Japanese? Thought so. It's kind of cruel of 4Kids to change Kojirou's last line before he and his friends get crushed to death, but them's the breaks.